Mmmmm, crunchy! At least when they go in. Here’s a little something sweet for Valentine’s Day. Or any day. I love visiting the closeout rack at my local market. It’s often filled with super bargains, plus things I would never think of buying (especially not at their original price!). The other night it turned out to be Heath® Milk Chocolate Toffee Bits. At their original $3.99 for 8 oz. / 226 g, they seemed extravagant, but at half off, I was fished in. By and large, this is a pretty standard banana bread recipe, with the exception of the toffee bits and two other things: I subbed sour cream for my usual buttermilk, since I had the former and not the latter; and I added a couple of tablespoons of Guittard Cocoa Rouge, because I wanted to counteract the sweetness of the toffee and milk chocolate a smidgen. Feel free to employ your favourite existing banana bread recipe, substituting the toffee bits for nuts as an add-in; this was just another opportunity to help clean out the pantry. After baking, the chocolate toffee bits melt and recede into the background somewhat, which wasn’t what I had expected; they do, however, leave behind a subtle but distinct sweetness that meshes well with the bread. This recipe was adapted from the Food Network’s “Classic Banana Bread” recipe. Today’s moment of Zen: Life is not a series of ever-ascending triumphs. I made a fast-and-easy (and tasty) pudding cake yesterday, but when I unmolded it from the Bundt pan, the top part of the center segment didn’t seem to want to leave the pan. And that left me with a small problem. What could I do to make it look somewhat deliberate, or at least prevent it from appearing damaged? Since the pieces around the edge seemed to resemble a flower, I filled in the center with peach butter to help complete the illusion. Could have been anything, actually, and I may employ salted caramel or some other fruit filling next time, intentionally, because I liked the outcome. Sometimes it takes a fortuitous accident to inspire a rethink. Preheat oven to 350°F / 175°C. Combine liquid ingredients with eggs. Add pudding and cake mix a bit at a time; beat until smooth. Pour contents into greased Bundt pan or other cake pan. Bake for 35-37 minutes in Bundt pan (less in cake pan), until a toothpick in center comes out smooth. If using a Bundt pan, cool on rack for 15-20 minutes, then unmold. Create space for filling by hollowing out a bit of the center. Add peach butter or other filling of your choice to the hollow. You could sprinkle powdered sugar on top, but it’s by no means necessary. Lots of room to play. And you know what? If it unmolds perfectly, and you don’t wind up “customizing” it, you’ll still have a tasty cake. Serves 8-16, depending on the size and appetite of your guests. One of the very first Greek dishes I can remember tasting (long before I ever visited Greece) was a deli-style version of this soup. This version recreates it fairly well (except for the chicken pieces), presuming my taste memory is accurate. The big plus here is that it can be made in a little more than half an hour, and requires practically no prep. Cook’s Illustrated and America’s Test Kitchen named Orrington Farms’ Chicken Flavored Vegan Broth Base & Seasoning as the best commercial starter for vegetable broth, and the latter published a recipe for making your own base. The downside of most store-bought vegetable stocks is that they’re sodium bombs, and many of them just don’t taste very good. The lemon in this recipe does a decent job of masking their weaknesses, but the better a veggie broth you use for a starter, the better the finished product will turn out. Former White House Communications Director and current ABC News commentator George Stephanopoulos makes a similar, if slightly more complicated, version if you want to watch an ordinary home cook in action. Tempering the eggs and lemon juice. 1. Heat vegetable stock and chopped dill (if you’re using it) in large pot or Dutch oven, to just below boiling. Add dried or cooked orzo when stock is warmed. DO NOT allow this to come to a boil, or it will curdle when you add the egg and lemon mixture, below. 2. While stock is heating, whisk eggs and lemon juice in a separate bowl. 3. Temper egg-lemon mixture by drizzling in 2 cups / 500ml warm stock while whisking continuously. Transfer tempered egg-lemon mixture back to soup pot. 4. if thickening with potato starch, place 1 tbsp. / 12 g in the bowl in which you tempered the eggs. Gradually whisk in a ladle of liquid from soup pot until you have a slurry free of lumps. Transfer slurry to soup pot and simmer for 15-20 minutes, stirring occasionally to keep orzo from sticking to the pot. Soup will thicken noticeably, enough to coat spoon. 5. Zest lemon over soup pot just before serving, and stir to incorporate. Whisk in white pepper to taste (if desired), and ladle soup into mugs or small bowls, making sure to get plenty of orzo. Garnish with dill if desired. 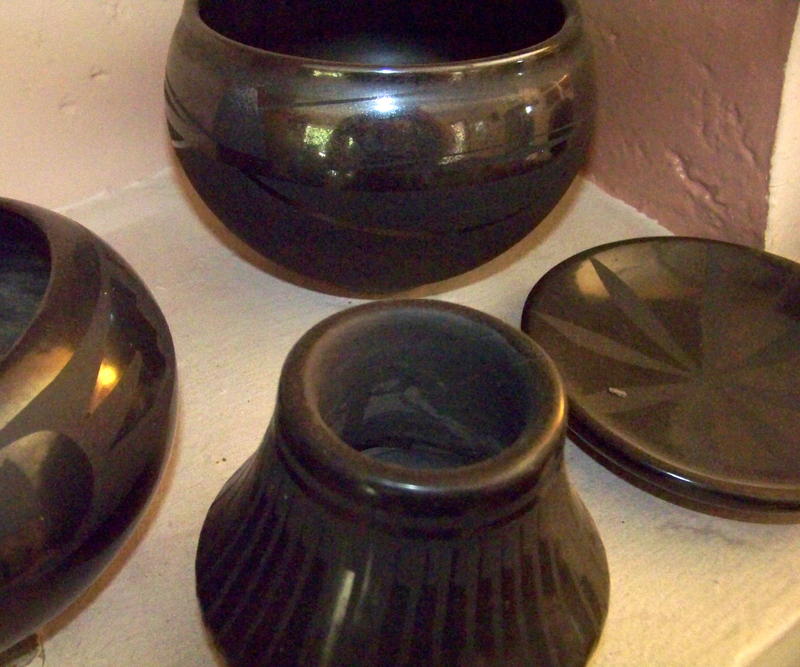 The cuisine was something of an eye-opener as well, from Cindy’s Santa Fe Bite-Size Bakery’s addictive chocolate pepper cookies to the local sparkling wine, Gruet. We were served a complimentary glass — one of the many perks of being on one’s honeymoon — and we drank it with some hesitancy at first. New Mexican sparkling wine? Seriously? 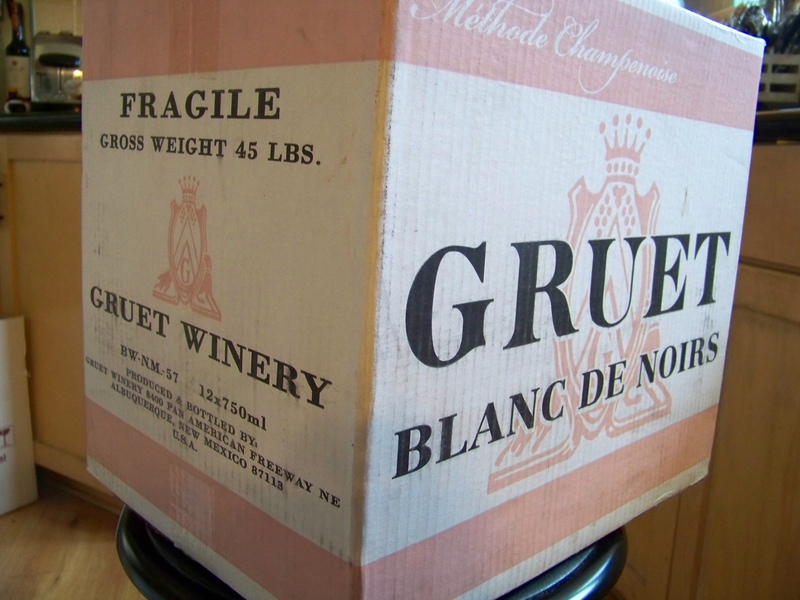 Turns out that the Gruet family, which had been making sparkling wine in France since 1952, was on vacation in New Mexico in 1983, and decided to put down roots and make both sparkling and still wines south of Albuquerque. Quite frequently, we serve it to our friends, introducing it to newbies with the phrase, “How about some refreshing New Mexican sparkling wine,” just so we can see the look of shock and horror in their eyes. It never gets old. Really. One day, as I was idly wandering the Interwebs, I came across a blog titled The Domestic Mama & The Village Cook, which featured a dish called “Idaho Sunrise,” which was apparently originally adapted from a recipe featured in Marion Cunningham’s The Supper Book. 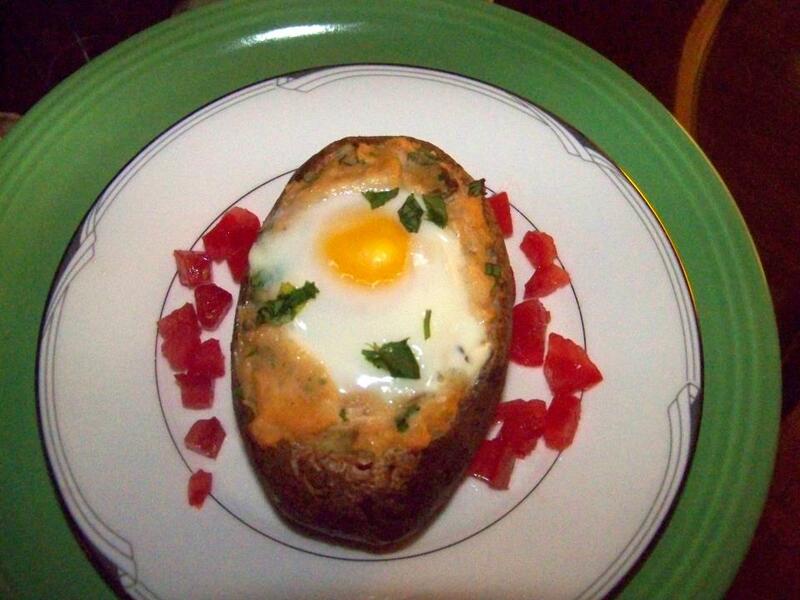 Basically, it’s a twice-baked potato with an egg on top, stuffed with mashed potato and bacon and chives. The excellent aspect of this recipe is that it’s as easily adapted to vegans’ diets (you can sub either a vegan spread or almond milk or vegetable broth for the sour cream/butter and omit the cheese), as carnivores’ (fry up some bacon to a crispy crunch and crumble it into the potato stuffing). 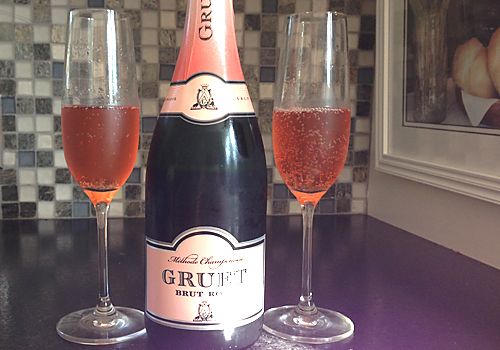 And no matter how you make it, the Santa Fe Sunrise goes great with a glass or two — or a bottle or two — of the Gruet Brut Rosé… just to keep the New Mexico theme intact, of course.